The coastal periphery was the home to some of the world's earliest known civilizations, with each of the three regions developing early civilizations around fertile river valleys. These valleys were fertile because the soil there was rich. The civilizations in Mesopotamia, the Indus Valley, and China shared many similarities and likely exchanged technologies and ideas such as mathematics and the wheel. Other notions such as that of writing likely developed individually in each area. Cities, states and then empires developed in these lowlands. The steppe region had long been inhabited by mounted nomads, and from the central steppes they could reach all areas of the Asian continent. The earliest known such central expansion out of the steppe is that of the Indo-Europeans which spread their languages into the Middle East, India, and in the Tocharians to the borders of China. The northern part of the continent, covering much of Siberia was also inaccessible to the steppe nomads due to the dense forests and the tundra. These areas were very sparsely populated. Archaeologists have found stone tools in Malaysia which have been dated to be 1.83 million years old. Western Asia saw the world's earliest transition to a Neolithic (settled farming) lifestyle. A temple area in southeastern Turkey at Göbekli Tepe dated to 10000 BC has been seen as the beginning of the "Neolithic 1" culture. This site was developed by nomadic hunter-gatherers since there is no permanent housing in the vicinity. This temple site is the oldest known man-made place of worship. Around 9000 BC the first fully developed Neolithic cultures appeared in the Fertile Crescent. Around 8000 BC the world's first town Jericho appeared in the Levant (present-day West Bank). It was surrounded by a stone and marble wall and contained a population of 2000–3000 people and a massive stone tower. The exact date is not established with certainty due to different results in carbon dating by different laboratories. Jbeil (Byblos), present-day Lebanon is another early site. The Neolithic culture of Jericho developed directly from the Epipaleolithic Natufian culture in the region, whose people pioneered wild cereal use, which then evolved into true farming. By 8500–8000 BC farming communities began to spread to Anatolia, North Africa and north Mesopotamia. Around 5500 BCE the Halafian culture appeared in the Levant, Lebanon, Palestine, Syria, Anatolia and northern Mesopotamia, based upon dryland agriculture. In southern Mesopotamia were the alluvial plains of Sumer and Elam. Since there was little rainfall irrigation systems were necessary. The Ubaid culture from flourished from 5500 BCE. The Chalcolithic period began about 4500 BCE, then the Bronze Age began about 3500 BCE, replacing the Neolithic cultures. The Achaemenid dynasty of the Persian Empire, founded by Cyrus the Great, ruled an area from Greece and Turkey to the Indus River and Central Asia during the 6th to 4th centuries BC. Alexander the Great conquered this empire in the 4th century BC. The Roman Empire would later control parts of Western Asia. The Seleucid, Parthian and Sassanian dynasties of Persia dominated Western Asia for centuries. Many ancient civilizations were influenced by the Silk Road, which connected China, India, the Middle East and Europe. The religions of Hinduism and Buddhism, which began in India, were an important influence on South, East and Southeast Asia. The Islamic Caliphate and other Islamic states took over the Middle East, Caucasus and Central Asia during the Muslim conquests of the 7th century, and later expanded into the Indian subcontinent and Malay archipelago. The Crusades would be fought from the 12th century, in Christian Europe's attempt to retake the Holy Land from the Muslims. The Mongol Empire conquered a large part of Asia in the 13th century, an area extending from China to Europe. The European powers had control of other parts of Asia by the 1900s, such as British India, French Indochina and Portuguese Macau and Goa. The Great Game between Russia and Britain was the struggle for power in the Central Asian region in the nineteenth century. The Trans-Siberian Railway, crossing Asia by train, was complete by 1916. 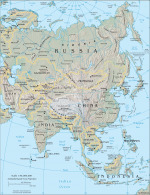 Parts of Asia remained free from European control, although not influence, such as Persia, Thailand and most of China. In the twentieth century, Imperial Japan expanded into China, Korea and Southeast Asia during the Second World War. After the war, many Asian countries became independent from European powers. During the Cold War, the northern parts of Asia were communist controlled with the Soviet Union and People's Republic of China, while western allies formed pacts such as CENTO and SEATO. Conflicts such as the Korean War, Vietnam War and Soviet invasion of Afghanistan were fought between communists and anti-communists. In the decades after the Second World War, a massive restructuring plan drove Japan to become the world's second-largest economy, a phenomenon known as the Japanese post-war economic miracle. The Arab-Israeli conflict has dominated much of the recent history of the Middle East. After the Soviet Union's collapse in 1991, there were many new independent nations in Central Asia. 4. "New Archaeological Discoveries and Researches in 2004 — The Fourth Archaeology Forum of CASS". Institute of Archaeology — Chinese Academy of Social Sciences. http://www.kaogu.cn/en/detail.asp?ProductID=982. Retrieved 2007-09-18.